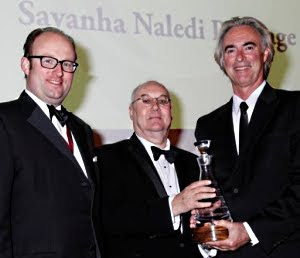 The Pinotage Association’s Abraham Perold Trophy for Pinotage, was won by Spier Wines for Savanha Naledi 2009 Pinotage. Andrew Milne, Chief Executive Officer of Spier was presented the Abraham Perold Trophy by Peter May, honorary Member of the Pinotage Association, in the presence of HRH Prince Robert of Luxembourg, the IWSC President pictured left at the IWSC awards ceremony in London’s 600 year old Guildhall on Wednesday 16 November 2011. The International Wine and Spirits Competition (IWSC) was founded in 1969 and is a premier competition of its kind. 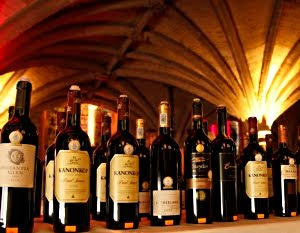 Its aim is to promote the quality and excellence of the world's best wines, spirits and liqueurs. This is achieved through a rigorous two stage judging process of professional blind tasting and detailed chemical and microbiological analysis. Opaque with bright purple rim. Highly perfumed nose with dark cherry, some truffle and lots of spice. Big, well rounded in the mouth with loads of body and fully packed with ripe fruit where as well as what the nose had plum and strawberry join the complexity. Supple tannins. Creamy flow and long, fruit filled finish. Naledi, which is pronounced Nah-leh-di, is the Sotho word for ‘star’. The wine was made by Frans Smit. The Pinotage Association’s Trophy is named on honour of Abraham Perold, South Africa’s first Professor of Viticulture & Oenology, who bred the Pinotage grape variety in 1925. The Pinotage Association exists to promote and maintain South Africa’s leading role in the production of quality Pinotage wines.